I think this is FreezerBurn IX...? FreezerBurn is an annual, invitational game day hosted by my friend John - the founder and one of the organizers of ToonCon. There are spots for 12 players who all play the same games throughout the day - scores, or, rather, positions are kept track of and overall standings reconrded. Everyone brings a game to put into the prize pile and the person in first place, at the end of the day, gets to pick first - so everyone goes home with a prize. I went to the inaugural event, eight years ago. I meant to go to the one in 2015... but ended up in hospital instead. I did make it to the one in 2017. The others... I don't make it to for various reasons - more often that not, though, because John insists on sending the invitation email to an email address that I haven't used for over five years and I find out too late!? 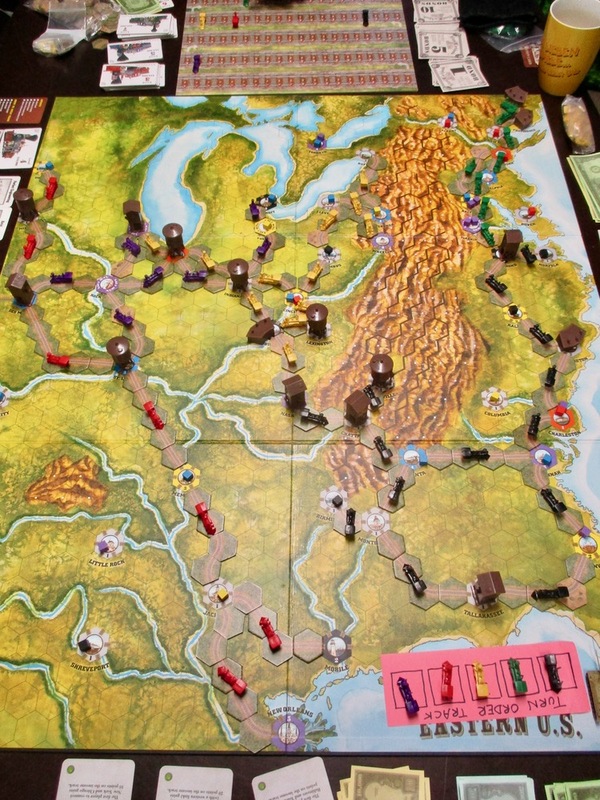 This year's line-up looked a lot like FreezerBurn I - with Small World, Railways of the World and Power Grid all being played in both. This year's game day didn't start as early as I remember previous ones... We all gathered at John & Brenda's place around 9:30 and started off with Small World. 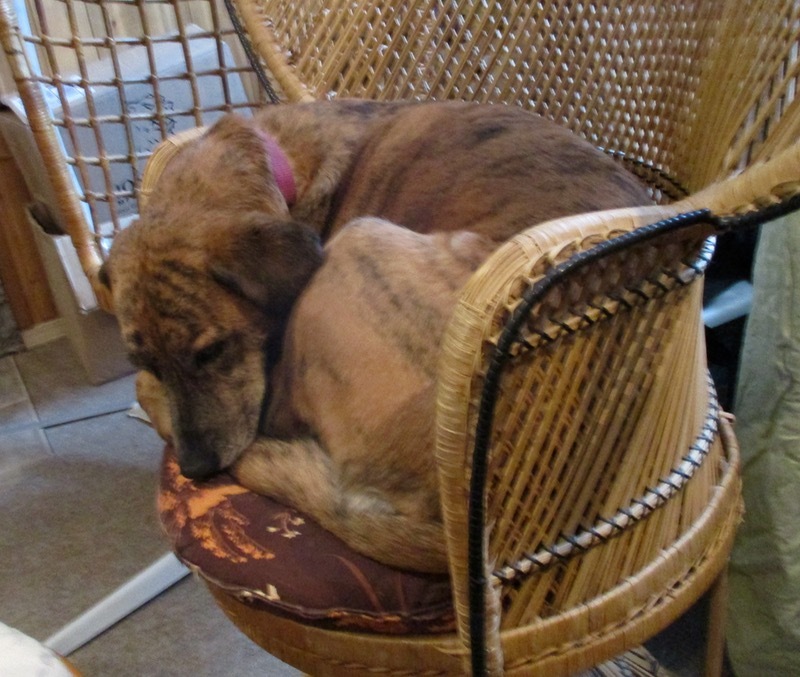 Bacchus - one of the denizens of Chez J&B. 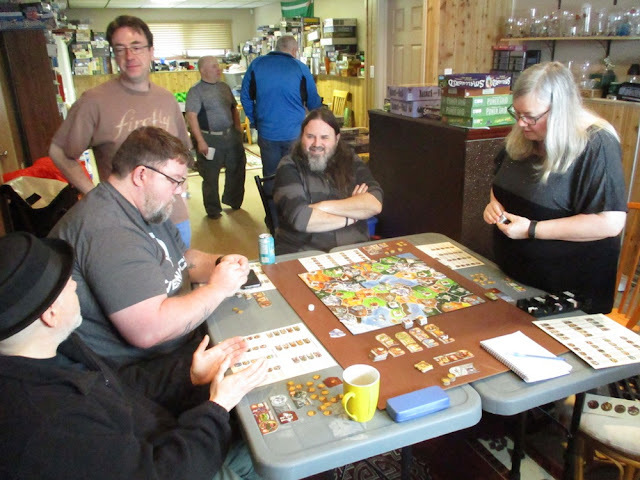 The first game I played in the morning was Small World, with (from left to right) Rob, Shane, Steve and Brenda. 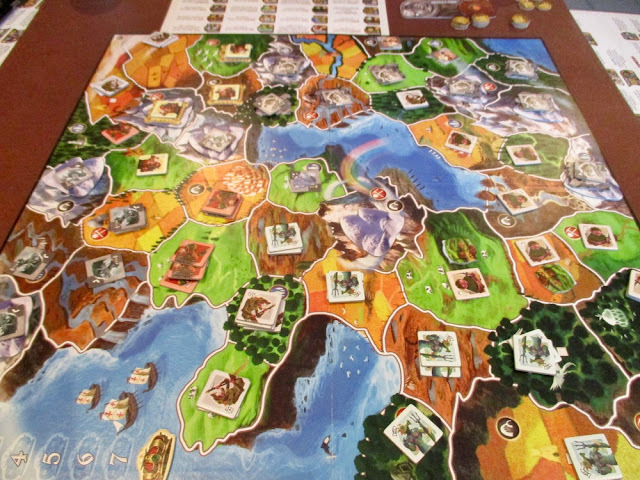 Brenda started off the game with Heroic Amazons and later took Pillaging Wizards. Rob took the Dragon Master Ghouls, Shane took Underworld Elves, and Steve took Bivouacking Skeletons. Rob was the first to put his race into decline (because, that's what you do with Ghouls - they can continue to expand and redeploy even in decline), his second race was the Spirit Giants - which was a great combo with the ghouls as, when they went into decline they didn't count as being "in decline" and thus he was able to have THREE races on the board at the same time (usually when you can only have one "in decline" if you start a third and still have vestiges of your first race, they are removed from the map). Shane started off with Underworld Elves and later took Wealthy Orcs. Steve Had Bivouacking Skeletons and later took Flying Ratment. . I started off with Alchemist trolls. My trolls plodded slowly across the map taking up residence in as many mountains as I could because with their defensive Troll lairs it makes them very had to shift out - even when they're in decline. I eventually took five mountain areas and three not-so mountain areas. No one even bothered to try and shift them from their locations and I collected points for them throughout the game. 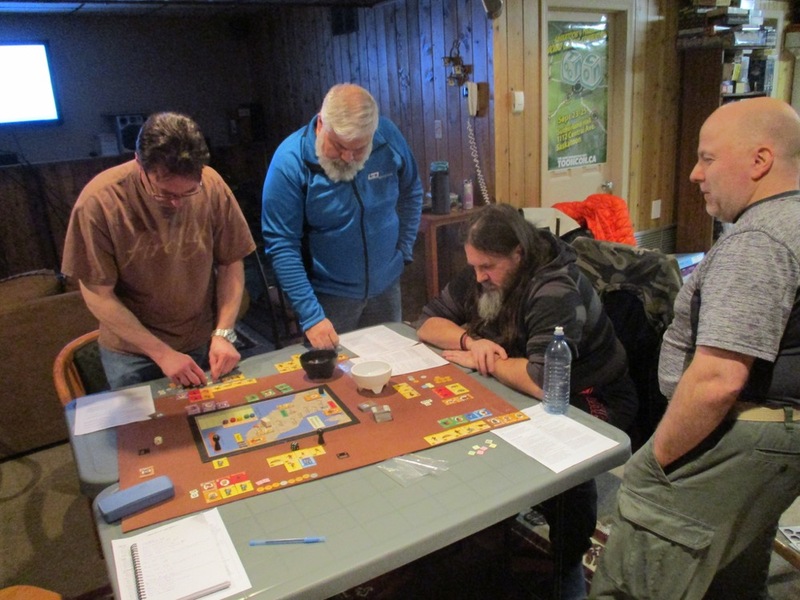 The second race I took were fortified Dwarves. Which got bonus points for being on mines (dwarves) and for each castle they built (fortified). By the end of the game I only managed to expand them into four areas, but two of those areas were Mines and three had castles. So by the last turn I was bringing in 17 victory points. Not to mention I picked up three just for taking the fortified Dwarves, because no one else had wanted them and had been leaving victory point/coins on them in the market to skip over them. I ended the game with 91 points - which won me the game. The rest were in the 70s and 60s.. 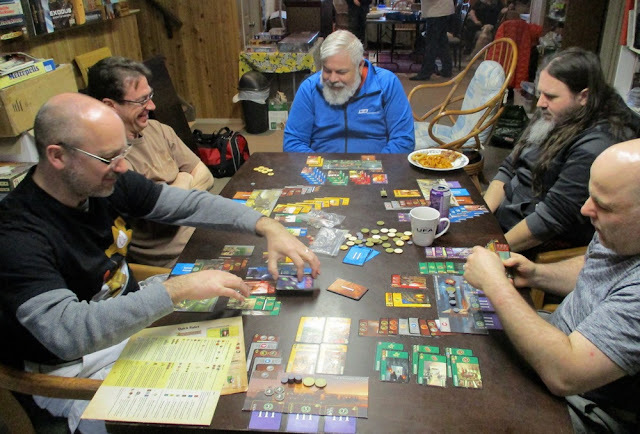 While we were waiting for lunch to arrive a few of us busted out 7 Wonders for a quick game. This was not a part of the games that were counted in the standings. I had The Pyramids of Giza, Brent had Babylon, Darrin had Ephesos, Kevin had Alexandria, Steve had Olympia, and Dan had Halicarnassus. Dan won with 67 points, I was dead last with only 40... Throughout the game I was forever plagues with being handed hands with three or four gcards that would be really useful for me (which I could take only one of...) and then hand after hand of stuff that was of little use to me - or very expansive to put into play. Ah well - it was still lots of fun. 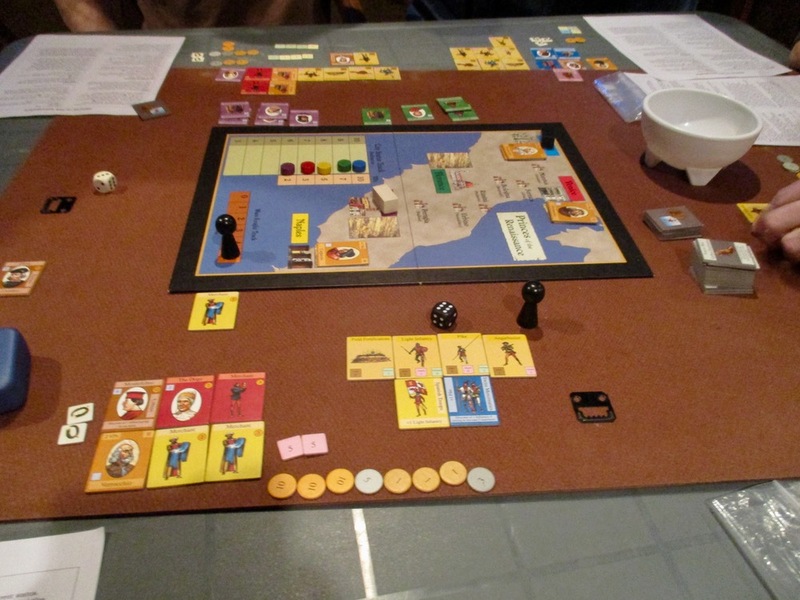 Princes of the Renaissance is a fun game by Martin Wallace which I had never played before. It's played over three Decade/Turns. unfortunately it took me the entire first decade to figure out the economy and mechanics of the game and by that point all of the good military stuff had been snapped up and hoarded by a few of the players and they dominated any military confrontation for the rest of the game - which can vastly change how many victory points you get at the end of the game... Super fun, though, I'd really like to try it again now that I have an inkling of what you're actually supposed to do. Despite having no clue in the first decade, and feeling like I was floundering in the next two. I did quite well - one point off of first place.... One of the biggest sources of victory points were from city tiles - you got victory points per tile based on the prominence of their related city at the end of the game - though my cities had been driven down in prominence (due to loosing a lot of military conflicts) I still did well because I'd actually bothered to collect city tiles - I had six (the maximum you can have - and I think the most anyone else had was four...? John had the standings posted on his widescreen TV all day. 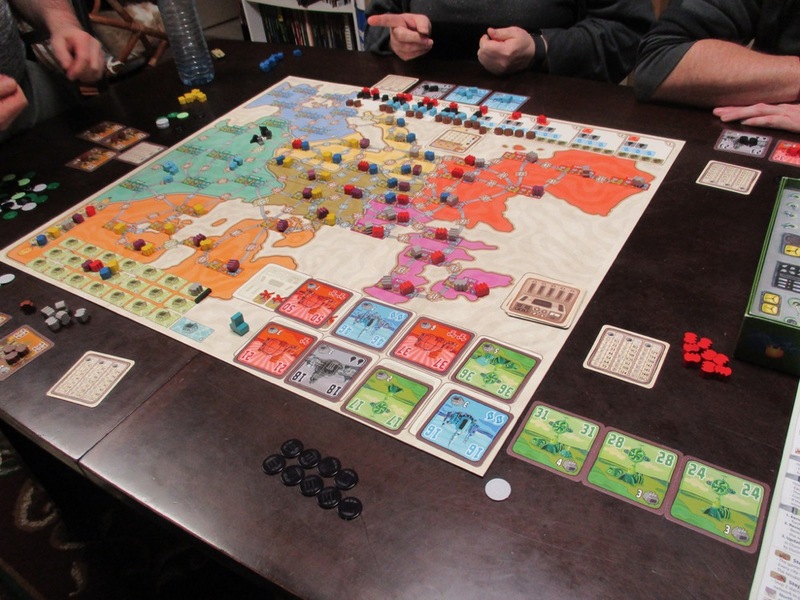 I ended up playing Power Grid Deluxe - the other table was playing the original Power Grid. Power Grid deluxe is actually the one I own - and have played twice in the last week, although the last two plays were on the North American side and this evening we played on the European side. The game was pretty fast and furious - it ended before we even got into the third step!? I ended the game only being able to power 10 cities. I had really hoped that 36 - or ANY 5 or 6 city generator would drop down into the available market for me to pick up in the last round we played... but it all ended up being 2 and 3 city generators (which were utterly useless to me). My network had expanded to 12 cities, and I had a pile of cash that I could have expanded to a few more and/or bought any larger generator that became available and at least tied for last with 12-13 cities... alas... Still, lots of fun. I just like playing this game. These were the games that were brought for prizes. They're supposed to be new or "near new". A few people bought new games, others brought games they had that they weren't going to play anymore. 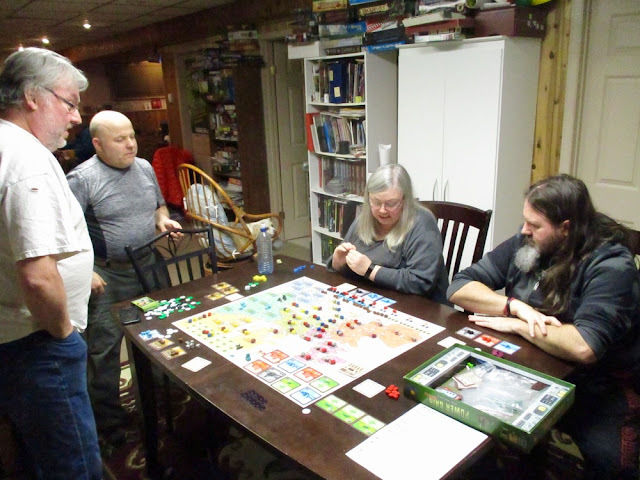 I brought the Neanderthal - which I never even got to play, but ended up crowdfunding the new edition along with the new edition of Greenland, so... didn't really need it. I ended up going home with Sidereal Confluence, which looks pretty interesting. It was a game of Brent's - he figured since John also had it he didn't really need to own a copy any more as if he was ever playing it, it'd either be at john's or with whoever took his copy home. The same thing happened at FreezerBurn 2017 - I took home Brent's copy of Nautilus - I've played it twice since then - both times with Brent! 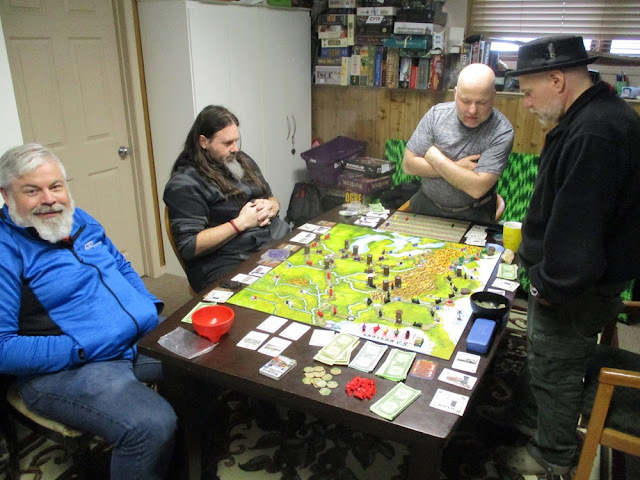 All in all - a totally fun day of gaming - and I got rid of a game I didn't need (hopefully Rob who took it home gets to play it and loves it as much as I love Phil Eklund games!) - and brought home a new game that I would probably never though to buy, but looks pretty interesting just the same. Finnegan had a good look at it when I got home and seems pretty interested in it. Aa update on the Wargaming Birthday Bash/Winter Wargaming Weekend (there have been some changes...). I'm hoping to update a few of my miniatures Galleries - as they are all hopelessly out of date. Some I just need to copy pictures in from painting update posts. Others I want to take new pictures for.